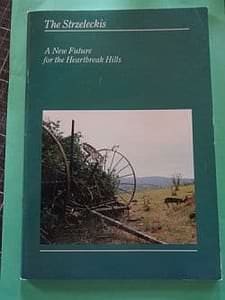 As background to our forthcoming excursion to Gunyah, here are some exerpts from the Forests Comission, Victoria: publication „THE STRZELECKI'S - A NEW FUTURE FOR THE HEARTBREAK HILLS„ - by Noble, W.S. In 1840 Paul Edmund Strzelecki set out from Sydney intending to reach Port Phillip and go on to Tasmania. After crossing the Latrobe River he and his party struggled for 22 days through danse bush along the main ridge of what later became known as the Strzelecki Ranges. This is basically the route followed by the Grand Ridge Rd. today. Great trees 90 metres high were linked by undergrowth so dense the men some-times threw themselves at it in an attempt to break through. Horses and a collecticon of scientific specimens had to be left behind and by the time the party reached Melbourne they were on the verge of starvation, exhausted and with their clothes in shreds. In the 1870's and 1880's settlers began to take up land in the hills. The prospect facing them was daunting. Huge trees, 90 metres and more high, with girths of between three and fifteen metres, covered tne hills. Beneath them grew a dense jungle of hazel, musk, wattle swordgrass and wiregrass. 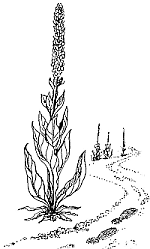 Swordgrass grew up to three metres high with leaves 25mm wide which could inflict a bad cut. The early settlers spoke of the loneliness of the „great scrub”, especially at night when the silence wes broken only by the bowl of a dingo, the grunting of koalas or the call of a mopoke. Neighbours' houses might be quite close but were not visible because of the dense vegetation. This was a rainforest area. The climate was wet for much of the year with a drifting easterly drizzle sometimes lasting for weeks at a time. Clothes and boots went mouldy and in winter mud was a serious problem. Leeches abounded and in some areas there were scorpions, not to mention snakes. Clearing the land was a formidable task. The usual method the settlers followed was to partly cut through the trees as they worked uphill, then, at the top, to fell one large tree which, by its weight, brought down the trees below in a giant accelerating collapse. This left a tangled mass of scrub, undergrowth and fallen timber which was left to dry then burned in January or February. Later began the backbreaking, dirty job of gathering the charred branches and trunks that remained and burning them in heaps that stayed alight for days. A selector of the 1880s told how he and his father took their supplies, tools and equipment by bullock wagon 24km from Morwell then for the remaining 2km carried everything on their hacks up the steep slopes. For the first year or two everything had to be brought in this way from Morwell, until the first growth of grass on the cleared land enabled them to keep a horse. Then they rode the horse to Morwell and led it back, loaded with supplies. As roads were Opened up they inproved access but in winter they became „mud canals” Horses became bogged in the seemingly bottomless mud and one pioneer described the wave of mud pushed up in front of a sledge like the bow wave of a ship. It took two generations oi back-breaking toil, self-denial and often of real privation to break-in the Strzeleckis. Those who did it were not to know that eventually the country would win. Also to be faced were the fires that swept through the hill country. The worst in 1890 burnt out more than 50 homesteads. There were fifteen bad fires between 1899 and 1944. It is indicative of what was to come that not many years later the Gunyah Progress Association was no more. Where the homes of its members once stood, tall eucalypts now grow. About the only physical remains of this early settlement are a few bric marking the site of the local hotel. Despite all the difficulties, the settlers made the most of the limited time an resources available to them for entertainment. Picnics and sports meetings were organised, concerts were held, mostly with local performers, but occasionally with visiting entertainers from Yarram or Traralgon. Dances were popular too=dancing went on til daylight, mainly because the roads were so bad that pe0ple avoided us them at night whenever possible. As the understanding grew among people that the clearing of the Strzelecki's for farming had been a tragic mistake, farmers began to sell up and move away. Others simply walked off the land. Blackberries bracken and ragwort grew thicker and rabbits became more numerous. When the First World War broke out many young men left the farms to enlist and the older folk found themselves faced with increasin pests, falling production and shortage of labour. The move away from the farms accelerated during the depression years. Farms in other areas were becoming increasingly mechanised but obviously tractors were impractical on the steeper hill country of the Strzeleckis. Younger men were unwilling to resign themselves to a life based on the older horse power. The wet climate, steep roads and isolation all played a part in the de—population of the ranges. One woman remembers how her parents struggled for nineteen years with the steep land, the weeds, the rabbits and the isolation. Then the day came when they packed what they could on the two horses and closed the door of their home behind them, leaving behind their furniture and even aer mother's sheet music (she had been a South Street competitor). Another man remembers how his family's farm of 145 hectares which had once carried 130head of cattle was reduced to a carrying capacity of two ponies when they left. Today it is possible to drive long distances through the hills without seeing a single occupied homestead. Halls where the people once gathered for the little entertainment they knew now stand deserted or have been dismantled and carted away. Today there are place names on the map which are names only - all the homes are gone, the dreams and hopes of their owners shattered. Today the tragic story of the Strzeleckis is being turned into one of hope. The bare hills, with their stark dead trunks of trees destroyed over many decades, with deserteci farms and vanished people, are being clothed with young forests of eucalths and pines. Deep in the heart of the Ranges lie two well known National Parks - Tarra Valley and Bulga Park. It will be a long time before the new eucalypt stands canapproach that sort of forest but at least the process of restoration is under way.